Since Honda introduced the 10th generation Civic back in 2015, they’ve been giving us little tastes of each different flavor. First the standard models of the sedan, coupe, and finally the hatch. During those two years, most of the spotlight was shining on the ever glorious Type R, even though it had yet to arrive. No longer the highest performing Civic in the lineup, it seemed as if the Si was no longer the favorite child in the family anymore. However after spending a week with the 2017 Civic Si sedan, I can tell you that it’s still the most important trim the Civic offers. Yes, even more important than the Type R and I’ll tell you why later on. The Civic Si is powered by a 1.5L DOHC direct-injected turbocharged engine with a maximum boost pressure rated at 20.3 PSI. Yes it’s true, there is no longer VTEC, but VTC (Variable Timing Control) can be found. Honda rates the horsepower at 205, same as the previous 9th Gen Si, but it feels more potent than that. The 192lb-ft of torque, produced as early as 2100 RPM, can really be felt and definitely helps the mid-range pull. Useful, especially when passing on the highway or coming out of a corner in a higher gear. Redline has been set to 6500 RPM, which is unusually low for an Si, but that’s what happens when you go turbocharged. The engine doesn’t sound particularly pleasing to the ears, especially inside the cabin where it’s actually pretty quiet. It’s simply not as shouty as the previous Si with the naturally aspirated K24. An aftermarket exhaust system will improve the soundtrack without a doubt. As usual, Honda have kept with tradition offering only a 6-speed manual gearbox for the Si. When I previously reviewed the Civic Sport Hatch, I mentioned that the shifter wasn’t as good as it could be. Honda remedied that with the Si. Shifter feel is classic Honda – buttery smooth engagement and short throws. It almost brings to mind the shifting feel of an S2000 and that’s saying something. Gear ratios are quick and nicely laid out to accommodate any situation whether you’re commuting on the highway or on your favorite back road for an enthusiastic Sunday morning drive. As with most new cars, the clutch pedal is almost effortless, something I would to like see changed. I personally like a little bit of weight and feedback to the third pedal. One of the best handling front-wheel drive cars on sale today. Moving on to the handling and suspension – my favorite part. A first for Si, adaptive dampers are utilized, and as standard equipment, no less. Driving on the fantastically rough roads of Los Angeles, the Si absorbed every bump, crack, and dip it came across with poise. Once the road began to wind, I was able to see what it was fully capable of and I must say that I was quite impressed. First, I did a few miles uphill with the suspension set at normal mode. I have to mention that the tuning of the dampers at normal mode is noticeably stiff for being straight from the factory. The ride is stiff, but still comfortable for everyday driving. If you’re coming from previous Si models, you’ll be pleasantly surprised. A big improvement in the handling department can also be credited to the increase in tire size. The previous Si came with 225/40/18 sizes all around. The new 10th gen now comes with 235/40/18, the widest tire to ever come out of an Si straight from the factory. My specific tester actually came with the optional summer tire package, Goodyear Eagle F1 Asymmetric 2, which only cost $200 extra. Not the stickiest rubber, but they performed well when pushed to the limit. Once I hit the Sport button on the center console, the digital instrument panel started to glow red. The Si was ready to take its gloves off and have a real fight with some corners. In Sport mode, the adaptive dampers change to a more aggressive calibration to tighten up the compression and rebound. After only a couple of high-speed sweepers, it became obvious that damper settings had gotten stiffer and I was ready to give it the full beans. Even in sport mode, there is a tad bit of body roll, but the good kind. The weight that’s been shifted to the outside of the corner hunkers down the Si and just helps it keep on gripping. You simply point and shoot towards the apex and it will be done with precision and swiftness. Even if you overshoot a corner, the minor understeer moment will correct itself once you let off the throttle and let the rear move around. The helical LSD really comes in handy in the tighter corners, allowing you to get back on the gas as early as possible. And with the huge mid-range torque from the turbo engine, you simply rocket off at corner exit. If I’m honest, I don’t find the Si Sedan to be a particularly beautiful car. If someone asked me to use one word to describe the design styling, I’d say that it’s aggressive. Chiseled and sharp lines can be seen at all angles. The aggressively sporty styling suits the Si though. Being a sporty version of the Civic lineup has to look the part and it certainly checks off that box. The black accents on the front bumper look good, but what’s up with the enormous black vents? I’m all for air vents to serve a function, but one side is completely blocked off and the other one has a tiny corner where the vent is actually open to let air pass through. Moving onto the rear, two more black vents are found on either side of the bumper. Both are completely blocked off, again I’m scratching my head to why they’re there in the first place. 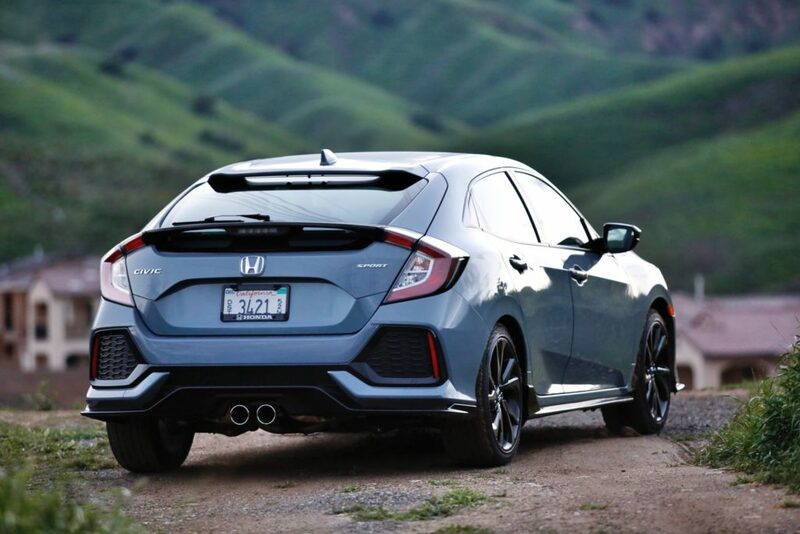 Lastly, I wish the Si came with the same dual-tipped exhaust that’s found in the Sport Hatch. The Si’s exhaust finisher looks like the end of a micro-USB charger cable. Minor gripes as far as the styling goes, and they don’t keep me from wanting to buy the Si in a heartbeat. Take a step inside the Si, and you’ll be reminded of the other 10th gen Civic interiors but with a lot more red stitching. The seats have excellent bolstering and support you when you’re pulling almost 1 G in the corners. They’re comfortable on longer drives and the seating position is excellent giving you great visibility looking out into the windshield. The small diameter steering wheels feels good in the hands and all the buttons you need are easy to operate as well. The shifter is great as I mentioned before, but be careful when parked in the summer time as it gets very hot. The pedals make sure your feet will never slip with the rubber inserts. Heel-and-toe downshifting isn’t as easy as the previous Si due to the fact that the throttle pedal travel is significantly lower than the brake pedal. Blipping the throttle requires you to put in more effort when rotating/shifting your right foot over. After a few tries, you’ll get the hang of it. The infotainment touchscreen display is user friendly, especially when using Apple CarPlay or Android Auto. With an MSRP starting price of $23,900, the Si is a whole lot of car for not a whole lot of money. After reviewing the Sport Hatch, I was certain that it was going to be my new daily driver in the near future. However, after having the Si for a week, it would almost be silly if I got the Sport. I like to call the Si, the Sport +. All the goodness of the Sport (without a hatch), plus the Si goodies like the adaptive dampers, helical LSD, and Apple CarPlay/Android Auto. For an enthusiast, the price premium is worth it. The Si to me is still the most important trim level the Civic is offered in because it’s the one that enthusiasts can all get into without breaking the bank. Let’s face it, the Type R is finally here in the States, but dealers are selling them for $50k. Prices will level off hopefully sometime next year when the hype dwindles down. In the interim, the Si is the hot Civic to have. It ticks a lot of boxes for not a lot of money.